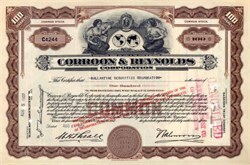 Beautifully engraved certificate from the Corroon & Reynolds Corporation issued in 1937. This historic document was printed by the Hamilton Banknote Company and has an ornate border around it with a vignette of the company logo between allegorical women. This item has the printed signatures of the Company’s President and Treasurer and is over 69 years old. Willis has an illustrious history. Its origins lie in the early 19th century with the founding in London of three firms, Henry Willis & Co, Faber Brothers, and Dumas & Wylie, the first two of which merged in 1897 to form Willis, Faber & Co. When that firm was joined by Dumas & Wylie, in 1928, the famous name of Willis, Faber & Dumas Limited came into being. R A Corroon & Co. Inc., was established in New York in 1905. In 1966 it merged with C R Black Jr Corporation. Of a great many subsequent amalgamations the most significant was with Synercon Corporation, of Nashville, in 1976. In mid-1998 the Group's shareholders accepted an offer from the leveraged buy-out specialists Kohlberg Kravis Roberts. Consequently the Group, which had been publicly quoted since 1976, reverted to being a private company. In 1999, the Group's operations amalgamated under one name Willis Group Limited. 1968 Corroon & Reynolds Corporation name was changes to Corroon & Black Corp.